Screwfix has a fantastic relationship with its customers, making them the leading supplier of trade tools, plumbing, electrical, bathrooms and kitchens to tradesmen, handymen and serious DIY enthusiasts all over the UK. Screwfix always aims to consult its audience at the start of design and throughout testing, to ensure both Screwfix and its customers benefit. For the trade, being able to rely on a supplier is crucial for being able to get a job done. Screwfix’s loyal customers love the way the service is adapted to support their own business. Over time, the original website had evolved to reflect internal structures and jargon, more than how customers think. We invited customers from the trade and DIY enthusiasts to discuss how they would categorise products, using card sorting techniques. The insight was invaluable, enabling the number of categories to drop from 32 to a more manageable 17, with sub categories labelled in terms customers identified with, resulting in easier navigation straight to the products customers want to buy. Now that customers could find the products they were looking for, it was essential to ensure that they could get through the checkout. 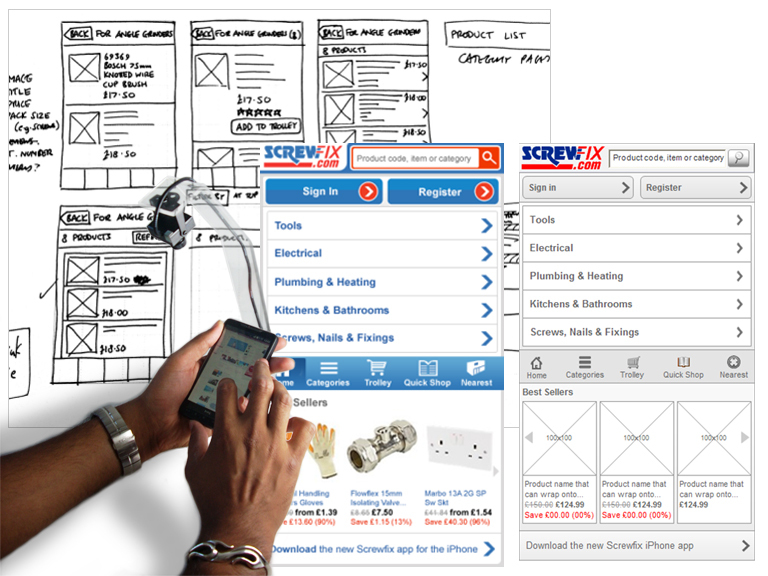 Screwfix worked with Bunnyfoot to optimise the designs by iterating from initialpaper prototypes through to fully interactive wireframes – with evidence coming from testing with real customers at each stage. The final designs were based on solid evidence that showed which of the multiple competing models of the purchase journey would be best, and what language and design would be the most effective and persuasive. Testing early designs for the introduction of a “collect from store” service to the website provided strong evidence to break from (what was then) the traditional e-Commerce model. It proved that the investment in providing this service would result in a good ROI. Follow-up testing allowed us to refine the design to improve its clarity and efficiency. Now, customers can put collection and delivery in one basket and check out in a single transaction, and 40% of business orders are made online for collection in-store. Working with development partners for implementation, Bunnyfoot executed a full user-centred design of the Screwfix mobile experience. User-centred design is like working off blueprints with an architect – it’s much easier to move a door while you are in the design phase than after the place is built!